Home » boy scouts of america , corruption , homosexuality , political correctness run amuck , what the hell were they thinking » Bullying from Boy Scout big-wigs?! Executives manipulating data?! Gay policy under fire from on high?! Bullying from Boy Scout big-wigs?! Executives manipulating data?! Gay policy under fire from on high?! If true... IF this is at all true... this represents the most insane turn of events that I have ever seen coming out of the Boy Scouts of America in my thirty-some years affiliated with the organization. First, I wish to direct your attention to an article by Austin Ruse on the website for Catholic publication Crisis Magazine. Titled "Something Rotten in the Boy Scouts", Ruse raises a red flag about apparent manipulation of data at the Boy Scouts home office regarding the possible change of policy that would allow boys of homosexual orientation to have membership in the Boy Scouts. There’s deception going on in the front office of the Boy Scouts. It includes deliberate misrepresentation of polling data, and threats to pack an upcoming meeting with anonymous and unqualified voters so that the Boy Scout policy on homosexuality gets forced on the majority of Scouts and parents who don’t want it. The Boy Scouts are considering changing their policy of not allowing open homosexuality in either their Scout or leadership ranks. The policy has placed the Boy Scouts in the buzz saw of the zeitgeist and up until recently they have resisted. There are some weak-kneed leaders who want to throw over the policy and appear willing to violate the Scout Law to do it. Do Scouting parents want to overhaul the policy and allow open homosexuality in the Scouts? The Executive Summary of the Poll says, “yes”, but the numbers say “no.” Fifty percent of Cub Scout parents support the current restrictive policy while 45% oppose it. A whopping 61% of Boy Scout parents support the current policy. How did Boy Scout leadership get anywhere near the assertion that a majority of those in Scouting support homosexuality in Scouting? Part of what they did was what is known as a push-poll, a questionnaire designed not to elicit an accurate opinion but one designed to change opinions. The entire article cannot be recommended enough because Ruse's piece is by a wide margin among the best and most informative that I've found about the matter of homosexuality in the Boy Scouts. Which, shouldn't be a matter at all. The Boy Scouts are not meant to be a tool of politics. Especially the politics of radical homosexuality. The Girl Scouts of America let that happen to them and look at them now: a pitiful shadow of their former selves. And one that has lost significant numbers of past and potential members to competing organizations for girls and young women. But then comes this bit of information, which is even more full-tilt whacko. 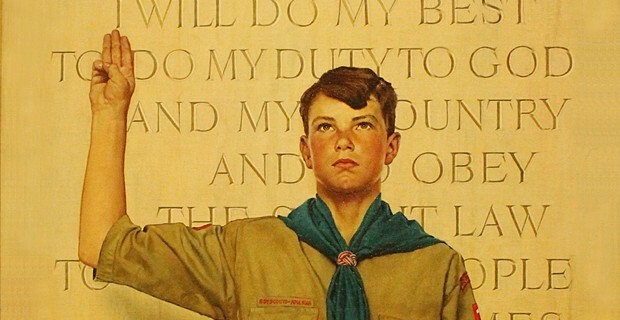 A week ago I wrote about the Boy Scouts of America and how homosexuality is a concept which is in total conflict with the principles of the Scout Oath and the Scout Law. In that post I mentioned OnMyHonor.net: a group of Scouts, Scouters and supporters who "are united in their support of Scouting's timeless values and their opposition to open homosexuality in the Scouts." OnMyHonor.net has become a significant presence in this discussion, its leaders appearing on nationally televised news broadcasts in recent days. "Today, top BSA officals contacted OMH coalition partners to ask them to stand down! LOL. (not a joke)." Is this right? 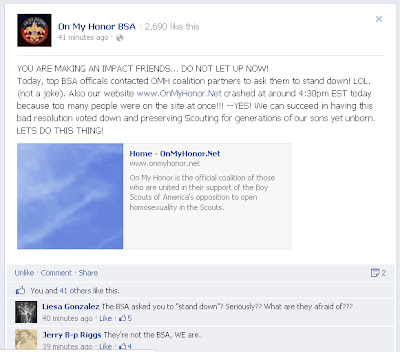 OnMyHonor.net has been told to cool it by the executives of the Boy Scouts of America's national office? How the hell is what the BSA head office doing honorable? HOW is it at all honest, "morally straight", or respecting the Scout Law? It is not. It is NOT!! There is other information which in recent days I have been made aware of regarding next month's vote to keep or change the policy. I haven't had enough corroboration about that information to confidently write about it but if there is any substance to those as well, in the mind of this blogger the executive are guilty of even more shameful acts, apparently for the cause of political correctness. And if there is the least shred of truth to these assertions, if the Boy Scouts top executives are behaving in such a manner, then they should do the honorable thing and step down and leave the Boy Scouts of America. They should make way for true leadership which is sincerely dedicated to the principles of Scouting which Lord Robert Baden-Powell knew were needed for young boys to become the responsible leaders that this world sorely needs. Well that's typical right wing behavior. Don't like the results of a poll? It's skewed to the left. Don't like election results, claim fraud. Remember the last Presidential Election? The 'baggers whined and denied to the end, and were floored when the polls and election results were proved true. So, deny the truth from the BSA all you want. Bigotry and discrimination will no longer be tolerated by society, OR the Scout Oath/Law. As for the OMH scumbag ambulance chaser Stemberger claiming the BSA told him to "stand down", he lies like a rug. Unlike you, I've read the report. I advise you to do the same. The BSA is indeed ignoring most if not all of their own findings.